How does the hopping mechanism of the Minerva II rovers work? The Minerva II rovers deployed to Ryugu by Hayabusa 2 have gotten a lot of news coverage for their hopping method of locomotion. Is there public information on exactly how this works? I seem to recall reading that it was some kind of off-center weight that can be made to rotate, but I'm surprised I haven't been able to find any popular coverage that gave any more detail than that. Is that basic idea right? Are there any cutaway diagrams available to the public? Are there details about rate of rotation and average velocity during a hop? How big, and how massive, is the mechanism compared to the rest of the rover? They do this by moving a "torquer" in their interior, which rests atop a disk-shaped turntable. 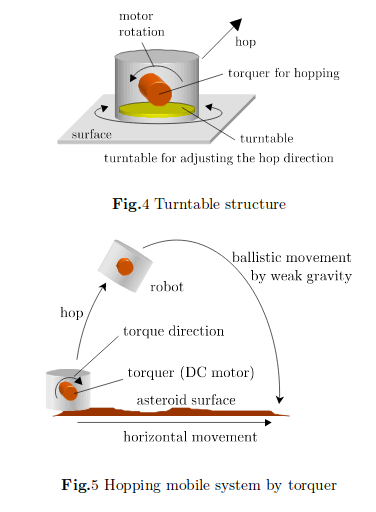 "By rotating the torquer, a reaction force against the asteroid surface makes the rover hop with a significant horizontal velocity," a team of researchers led by JAXA's Tetsuo Yoshimitsu wrote in a 2012 study outlining the concept. "After hopp[ing] into the free space, it moves ballistically. With this mechanism, by changing the magnitude of torque, the hopping speed can be altered, so as not to exceed … the escape velocity from the asteroid surface." The MINERVA-II rovers control the direction of their hops by manipulating the orientation of the turntable, the scientists added. These hops can last for 15 minutes and cover about 50 feet (15 m) of horizontal distance. Not the answer you're looking for? Browse other questions tagged asteroid rovers hayabusa2 or ask your own question. How does NASA keep radiation from frying rovers? Does new technology make it advantageous to have walking rovers? What criteria was used to select potential landing sites for Hayabusa-2's rovers on Ryugu? What causes Hyabusa-2's close-up images of Ryugu to be dark in the corners? How does Hayabusa-2's “Communication Simulator” on its website work? What does it show? How far will Hayabusa-2 back off before the “bomb” goes off?